For this card, I used one of the photopolymer stamps from the Pop & Place Bundles, Christmas Tagables. It has such cute sentiments! I also used some of the envelope liners for another layer on the card. Here I used the stamp set that coordinates with this set, Merry Little Christmas. I inked it up with Real Red and Gumball Green Stampin' Write Markers, the colours in the paper used in this kit, along with Coastal Cabana and Whisper White. I arranged all three stamps on one acrylic block, so that I could, if I wanted create multiples of this card without trying to duplicate the arrangement each time, a definite plus of clear mount stamps. Here I used only a Classic Stampin' Pad in Real Red to ink up the same arrangement of stamp images. You can see the envelope liner used to do what it was created for, line an envelope! 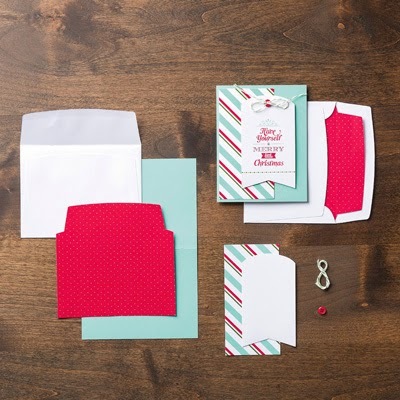 Here's what you get in the kit: Elements to make 8 cards: cardstock cards, envelopes, envelope liners, die-cut Designer Series Paper and cardstock accents, buttons, Baker’s Twine. If you need a few cards for Christmas and you don't have much time, this is the kit for you. You can bundle the kit with the stamp set, either wood mount or clear mount and save a bit. You can purchase the kit in my on-line store. Just click on the links below! Thanks for dropping by today!